Maybe I'm doing something dilly..
Maybe I've missed something but I cannot get the Object Properties, and Project Explorer windows to appear. As in the pics you can see the windows are enabled, but 'invisible'. 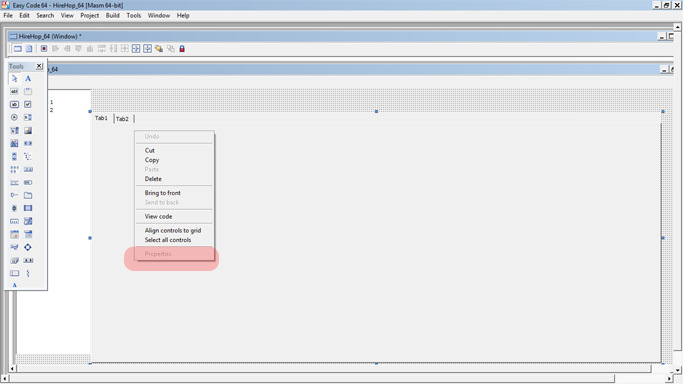 Added to that when I select an object in the visual editor, the 'Properties' menu item is disabled ? I haven't played on the 2000 editor for a while and wonder if I've disabled something. Re: Maybe I'm doing something dilly.. 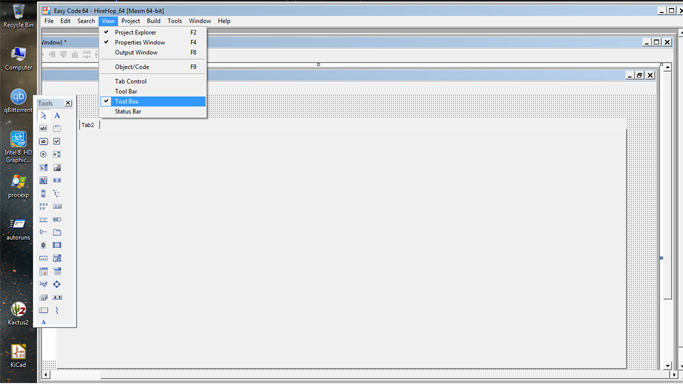 I am afraid that for some reason the IDE height and width have become greater than the screen height and width, so the Object Properties and Project Explorer are visible but they are just “out of the screen view” and that is why the Properties menu item is disabled when you select an object (this menu item is only enabled when the Object Properties is hidden). This will make the left, top, height and width to get their default values. Now save the “.ini” file and run EasyCode.exe. Thanks Ramon, but that didn't work. What I did do, was delete the 'easycode.ini' file and it restarted fine = all working well. This must have had something to do with copying the whole Easycode2000 folder from my PC (1920x1080) to my laptop which has a resolution of 1366x768. Glad to hear all is working well. Deleting the 'easycode.ini' file is always the best solution, but I just tried to avoid you losing the whole configuration.